HollyBarry House has a vast number of resources for the perfect gift that matches your occasion & budget. Only a sampling is shown on our site. Our more in-demand items are stocked, but many more options can be ordered for you. Contact us for any additional gift suggestions. From art objects to baby items to spa products, we can provide gift items to which you’ll be proud to attach your name. HollyBarry House is the place to call for the perfect gift. We’ll not only work with you offering suggestions you might not have thought of, but can help in creating the wording for your greeting, and of course take care of delivery or shipments. 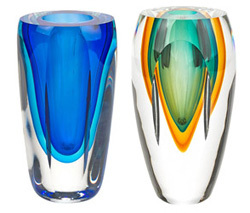 Rich colors of crystal are angled to create fascinating designs within the surfaces for a full 360-degree delight. "Azure" (left) is 6" high and "Astral" (right) measures 6.5". 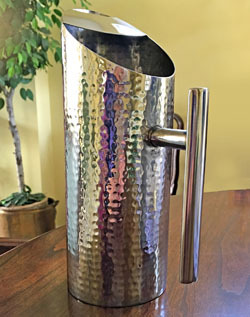 This sleek pitcher is dressy enough for fine dining and casual enough for morning orange juice. It measures 11" tall, with a 52-oz. capacity. ALSO AVAILABLE--2-sectioned hammered metal serving bowl. 11.5" diameter. Contact us to request a photo be emailed. 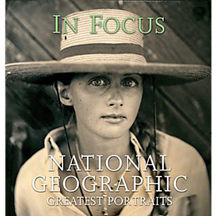 This is one of five mini versions of popular National Geographic photography books. Each book measures 6"x6.5" and contains page after page of the magnificent photos National Geographic is famous for. "In Focus" is the perfect title for businesses that keep their clients interests "in focus." Minimum quantity is 50 volumes. Customized letter or page can be inserted at slight additional cost. 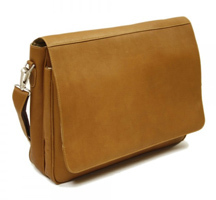 Luxuriant leather bag measures 17"x12"x4.25". Two spacious compartments include padded laptop pocket and full organizer. Adjustable shoulder strap. Available in saddle brown, chocolate brown and black. Pre-ordering required. 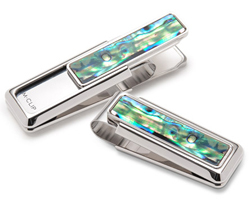 The unique sliding-lever design of these stunning money clips allows you to hold cash and credit cards more securely with less bulk. Available in gold and rhodium finishes along with anodized aircraft-grade aluminum and stainless steel models. Various styles are adorned with selections of alligator hides, woods, carbon fibers as well as mother-of-pearl and abalone shell. Initials or logos can be etched or engraved at additional cost. Have you seen our other Giftware? "(One of my) favorite vendors for this type of gift is HollyBarry House Ltd of Chicago...(Holly) owns HBH and she is terrific. She has a tremendous eye, sense of style and what is appropriate for all occasions. (Some) of my favorite items from Holly are unique hand-painted art glass dishes." "Working with (HollyBarry House) is so simple. All I do is tell something about the person receiving the gift and my budget. Holly comes up with wonderful suggestions and then handles all the logistics. My clients, friends and family are thrilled with the thoughtful items they receive. Holly makes them happy--and makes me look good!"! "...very creative and dedicated to finding great solutions for marketing and gift-giving needs. I've relied on (HollyBarry House) for both individual gifts as well as large scale business mailings, and it's always gone well!" Email or contact us with your budget and the occasion and we'll make gift suggestions to meet your needs.